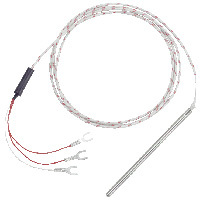 The SERIES 40T/40M Digital Temperature Switch accepts a variety of inputs to allow temperature measurements and set points up to 1999°F (1300°C). Observing the current status of the control is made easier with the 3-1/2 digit, multi-color LED display that has alarm, defrost and output symbols. For added versatility, the temperature units can be field selected for °F or °C. For cooling applications, manual defrost mode can be initiated by pushing a single button. A flashing alarm informs users when the current temperature exceeds preset limits. When programming multiple units, a programming key is available to reduce set up time. K T/C: -140 to 1999°F (-100 to 1300°C); J T/C: -140 to 1450°F (-100 to 800°C); RTD: -320 to 1200°F (-200 to 650°C); PTC: -58 to 300°F (-50 to 150°C); NTC: -40 to 230°F (-40 to 110°C); N. RTD: -110 to 570°F (-80 to 300°C). 16 A @ 250 VAC SPDT relay (max current allowed is 10 A). 12 to 24 VAC/VDC, 115 VAC or 230 VAC depending on model.